Arlington, VA plastic surgeon Dr. Talal Munasifi provides a full variety of facial cosmetic surgeries. One of the most popular surgeries at Advanced Plastic Surgery Center is a facelift. This procedure concentrates on specific sections of the face to address loose skin features to create a younger, softer appearance. Depending on your unique concerns, a facelift can focus on the eyes, the cheeks and mid-face, the bottom portion including the jowls, mouth, neck, and more for an all-over youthful look. The facelift method used depends on your goals, the condition of your skin, the amount of laxity present, age, lifestyle, and other influences. Dr. Munasifi has a host of techniques available to him, and he will choose the ones that are best for your anatomy and the results you want. The goal is to create a natural look that's soft and beautiful. Schedule a private consult today by calling our cosmetic office in Arlington, VA.
"I have recently has my second facelift by Dr. Munasifi (the first was about 14 years ago). I would not even consider another plastic surgeon. He is patient, listens to your concerns and best of all does an amazing job. I have been totally satisfied with every aspect of his practice and with his efficient and caring staff." "Dr. Munasifi is a great Doctor! I had my second facelift by him this year (13 years later) and I look and feel great! I never had any pain and my recovery was quick. The best part is that it is SO natural. Dr. Munasifi does specialize in cosmetic facial surgery and is FACS. The person below must not be familiar with the terms because P.C doesn't even pertain to a Doctors credentials.His staff is always great and makes you feel right at home. His coordinator, Brittany is great and very knowledgeable. Amanda and Johnna are also amazing. I highly recommend Dr. Munasifi!" "When I asked my primary care physician for a recommendation regarding the best plastic surgeon in the area, Dr. Munasifi was at the top of his list. I've been a longstanding fan of Dr. Munasifi for over twenty years now, undergoing several procedures with first-rate results. Trust is essential when choosing a plastic surgeon, as this came easily with Dr. Munasifi thanks to his many years of experience, reassuring nature, and complete transparency about what to expect. He listens carefully then provides expert advice on the best way to accomplish goals. He and his staff explain each procedure in great detail and are always available to answer any question. Post-op care is equally attentive with Dr. Munasifi always available to answer any question or address any concerns. he and his staff are highly professional while offering individual personalized service that makes patients feel relaxed and cared for. Dr. Munasifi is routinely listed among Washingtonian Magazine's top doctors. This well-deserved recognition is based largely on the glowing reviews given by the thousands of patients he has helped over the years. It is a privilege to know him and to be among those satisfied patients. I give Dr. Munasifi my highest recommendation." "I highly recommend Dr. Munasifi and his team for any plastic surgery procedure for the following reasons: 1. The team thoroughly explains the nature of each procedure so that the patient has a complete understanding of the objectives, any associated risks, the side effects and the recovery. No surprises. Comforting, professional cradling of the patient from beginning to end. 2. The team never assumes an "aggressive sales demeanor". Rather they consistently present themselves and their services in a professional, courteous manner which facilitates reasoned, thoughtful decisions by the patient." Facelift surgery takes about 2 – 3 hours to complete. The placement of incisions depends on your specific surgical plan, but they are placed in inconspicuous locations, usually hidden within the hairline at the temple and behind the ear, sometimes extending to the nape of the neck. In some cases, a small incision is necessary under the chin to remove fatty tissue. Excess skin is removed in precise amounts, and fat can be removed or repositioned as necessary to avoid too much tension on the skin to create a soft, natural, youthful look. The skin and underlying tissue, including the muscles, are then tightened, lifted, and sutured. After 4 – 5 days, the large bandages are removed from around the face, and many patients feel comfortable going out in public wearing hats, scarves, or camouflage makeup to disguise any noticeable bruising. For the majority of the bruising and swelling to subside, however, recovery usually takes about 2 – 3 weeks. It’s normal to experience some soreness, bruising, tightness, numbness, itching, and swelling. A prescription painkiller will be prescribed but typically Tylenol is sufficient. If you keep your head elevated during sleep for a few nights, you can help reduce swelling. You might also feel more comfortable sleeping on your back as you heal. You should refrain from vigorous activity for about six weeks, but light exercise can continue in about two weeks. Do not hesitate to call our office with any questions or concerns regarding your recovery period. We deeply care about your post-treatment care. A facelift with Dr. Munasifi improves signs of aging from the top of your cheeks to the middle of your neck. He takes a more comprehensive approach to facial rejuvenation and considers your facial contour as a whole so that you have a beautifully balanced appearance. He likes to create youthful results that look natural. While some practices may give different types of facelifts a variety of names, Dr. Munasifi believes in a holistic approach that rejuvenates all areas of your face and neck that have been affected by signs of aging. He will provide a facelift for you that is as extensive as you need based on what you wish to achieve. What kind of anesthesia is required for a facelift? In most cases, general anesthesia is used, and a facelift is usually an outpatient procedure. Anesthesia is provided by a board-certified anesthesiologist. Although you will be free to return home after your surgery, you won’t be able to drive. You will need to arrange for a family member or friend to pick you up and drive you home. Ask our front desk about our transportation services. Patients usually begin working from home within 4 – 5 days. Some patients who are comfortable wearing makeup to cover any bruising have even returned to the office or attended social events at this point. However, if you wish to wait until most bruising has subsided, we suggest allowing a two week recovery period after a facelift before returning to work. What procedures complement a facelift? If you have signs of aging around the eyes or eyebrows, an eyelid lift or brow lift can produce stunning results. These procedures are also frequently performed concurrently with a facelift in order to rejuvenate the entire face. In addition, fat grafting is almost always included with your facelift. This procedure uses liposuction to harvest fat cells from an area on the lower body. Only very small incisions are necessary. The fat is treated and then injected into areas of the face to restore volume and smooth out the contours. Dr. Munasifi has found this combination to provide the most beautiful and natural results. Yes. For fine surface lines and wrinkles that are caused by sun damage, laser skin rejuvenation is a wonderful nonsurgical adjunct procedure to a facelift. If the signs of aging are not too pronounced yet, you may find that BOTOX or dermal fillers are sufficient. These nonsurgical treatments are temporary, but if done regularly, they can sometimes delay the need for a facelift. 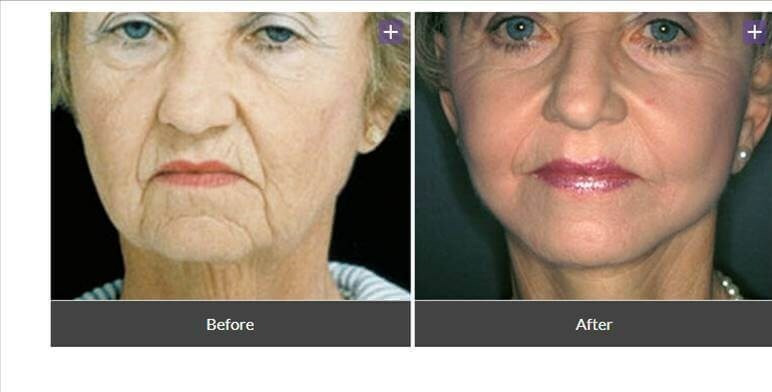 Dr. Munasifi’s facelift techniques are long lasting, but the aging process does continue and varies from person to person. If you care for your skin properly and avoid significant weight loss or gain, your facelift could last 10 – 12 years. Patient results will vary. Facelift surgery can take years off your face and create a fresh look. Today, there are many options for surgery based on your personal needs and goals. This treatment is designed to gracefully help you walk through each passing year looking gorgeously natural. To learn more, we invite you to call Advanced Plastic Surgery Center in Arlington, VA to set up your private consultation with Dr. Munasifi.